Remarks: TO SEE VIDEO, PLEASE GO TO:https://youtu.be/-VEX92ECh_I A stunning transformation from the former Candlelight Inn to a warm and inviting HOME! 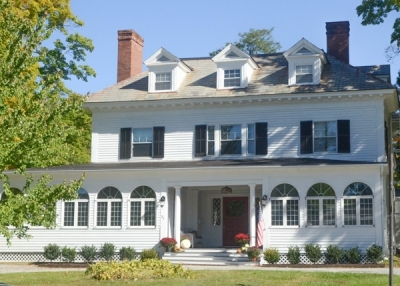 This 8 BR, 8 Bath home has beautiful common spaces with high ceilings and crown moldings, the original full bar from the Inn, now a fabulous entertaining space w/FP, plus large formal DR w/FP, living room w/FP and french doors to the game room, a light filled solarium and gorgeous new state of the art kitchen/great room. All this plus a 3 bay Carriage Barn, lawn and wonderful in town setting to enjoy all that the Village has to offer! All mechanicals have been updated and Central A/C added. Side view from Church St.